Turkish Talmudist and cabalist of the sixteenth and seventeenth centuries; born at Salonica; died June 6, 1629, at Venice, where he was rabbi and head of the yeshibah. It appears from Isaac Ḥayyim Cantarini's "Paḥad Yiẓḥaḳ" (p. 10b, Amsterdam, 1685) that Samegah had been previously head of the yeshibah at Padua. Ḥayyim Benveniste and Joseph Solomon Delmedigo were among his pupils. He was the author of "Miḳra'e Ḳodesh" (Venice, 1586), a treatise, in two parts, on the 613 commandments. The first, in fourteen chapters, treats of the love and fear of God, and the second, in twenty-one chapters, of the mysteries and meaning of the commandments. He wrote also "Porat Yosef" (ib. 1590), containing, among other treatises, novellæ on a part of the "Sefer ha-Halakot" of Isaac Alfasi and R. Nissim (relating to the treatise Ketubot and a part of Ḥullin), and novellæ on a part of the tosafot to Ketubot, Beẓah, and Zebaḥim; and "Perush Derek Yamin" (ib. n.d.), a work containing homilies, cabalistic notes, and an explanation of the Ten Sefirot. 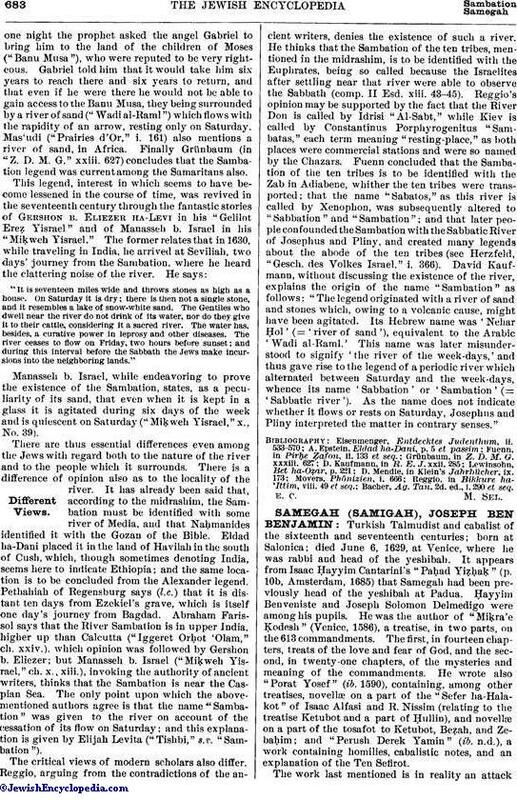 The work last mentioned is in reality an attackupon Menahem Azariah da Fano's "Yemin Adonai Romemah." Samegah's strictures were in turn refuted by Delmedigo in his "Maẓref la-Ḥokmah." A decision of Samegah concerning the shaking of the Lulab is to be found in Samuel Algazi's "Toledot Adam Ḳaṭon" (Venice, 1587); a responsum of his concerning the "Miḳweh" of Rovigo, beginning "Arazim 'ale mayim," is to be found in the collection of responsá entitled "Mashbit Milḥamot" (ib. 1606); and, finally, Ghirondi was the possessor of a decision signed by Samegah and Simḥah Luzzatto. 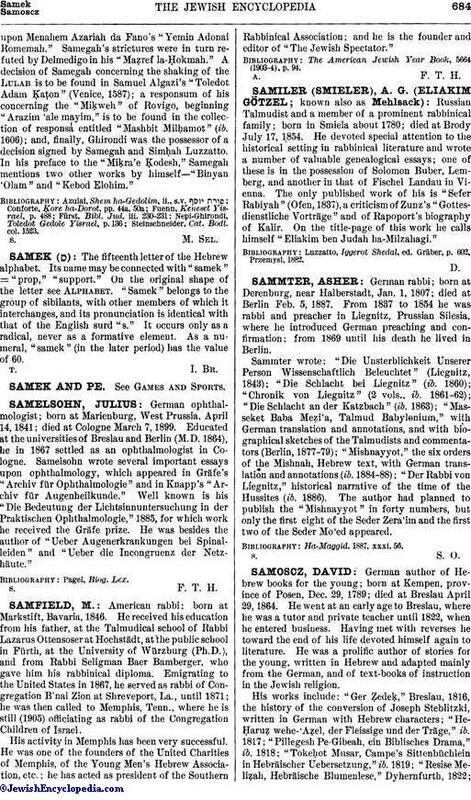 In his preface to the "Miḳra'e Ḳodesh," Samegah mentions two other works by himself—"Binyan 'Olam" and "Kebod Elohim." Steinschneider, Cat. Bodl. col. 1523.